In the Kung Fu Panda Ⅰ, as a kung fu fanatic, Po idolizes the Furious Five- Master Tigress, Master Monkey, Master Mantis Master Crane. 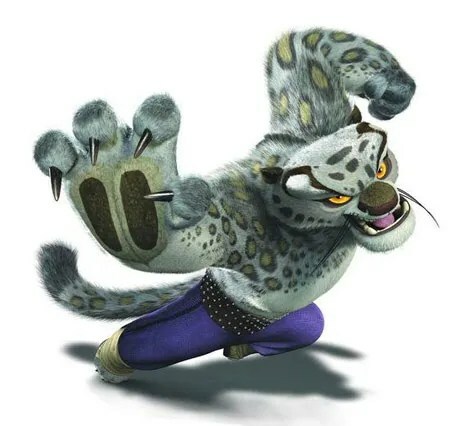 In reality, Other than the Po the panda, the Furious Five characters and Tai Lung are created and based on Chinese martial arts styles. In the Chinese martial arts, imagery of the Five Animals (literally “Five Forms”)—Tiger, Crane, Leopard, Snake, and Dragon—appears predominantly in Southern styles. An alternate selection which is also widely used is the crane, the tiger, the monkey, the snake, and the mantis. In Kung Fu Panda, Tigress uses Tiger Claw Kung Fu System; Crane uses Fujian White Crane Kung Fu; Monkey uses Monkey Kung Fu; Viper uses Snake Kung Fu; Mantis uses Northern Praying Mantis Kung Fu; and Tai Lung uses Leopard Kung Fu. Monkey style Kung Fu is a Chinese martial art where the movements imitate monkeys or apes in fighting. One of the more acrobatic kung fu styles, movements often include falling, lunging, grabbing, jumping, and tumbling. The staff features prominently in its weapons training, with practitioners using it for attack, defense, and even climbing it like a pole to gain height in combat. A wide array of facial monkey expressions is also practiced, inclusive of happiness, anger, fear, fright, confusion and bewilderment etc. Except for very brief periods, most movements inclusive of running are executed from either a squatting or semi-squatting position and are normally accompanied by very swift and ‘jerky’ head movements as the practitioner nervously looks around. The flamboyant movements and sometimes comic actions of the monkey style have made it a popular subject in martial arts movies. Tiger style Kung Fu is one of the local boxing in Fujian Province, southern China. Tiger Claw Kung Fu System was modeled after the demeanor and fighting strategy of an attacking tiger. The striking movements are lightning fast, agile and powerful. Techniques unique to Tiger Claw Kung Fu System are ripping, tearing, clawing and grasping applications. White Crane Kung Fu is a Southern Chinese martial art which originated in Fujian Province and is now practiced throughout the world. According to oral traditions, the creation of this style is attributed to Fong Qoniáng, a female martial artist. The characteristics of this style are deep-rooted stances, intricate hand techniques and fighting mostly at close range. 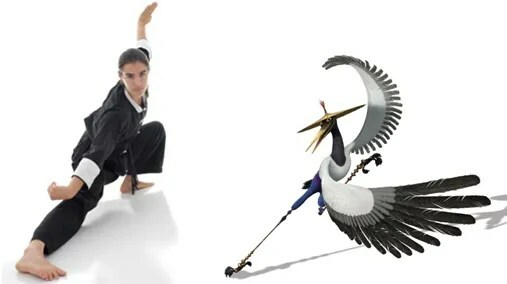 The Crane Stylist has no Weapons. As with the Crane, all parts are tools, wings, claws and beak. Snake style Kung Fu is created following the snake’s behaviors. Main routines of Snake style Kung Fu are composed of many animal-imitation actions. These actions mainly imitate the circling, flexion and extension, swallowing and stretching of the snakes. The movements should be flexible, link the whole body tightly and move forward along the wave curve. For Snake stylist, action should alternate hardness with softness, open and close properly. Emphasize on soft force, and combine pliability with toughness. Upper limbs and flank should be soft and easy to control; pelvic limbs should be steady and flexible. Make sure that the stance is flexible and the stake is firm and steady. Actual combat requires the body vibrate and the stance change, cope with the situation flexibly. Snake Style Kung Fu generally aims for weak points of the body, such as eyes, groin and joints. Northern Praying Mantis Kung Fu was named after the praying mantis, the aggressiveness of which inspired the style. Northern Praying Mantis is especially famous for its speed and continuous attacks. It emphasizes on fighting according to its movement, looking for the weakness of the opponent and hit his weak point, fighting in order to defend, hitting and smashing hardly and firmly. It is fast and agile, with the image of the mantis. One of the most distinctive features of Northern Praying Mantis Kung Fu is the Praying Mantis Hook: a hook made of one to three fingers directing force in a whip-like manner. The hook may be used to divert force (blocking) or to attack critical spots (eyes or acupuncture points). Leopard Style Kung Fu was founded on the creators’ observation of the movements of the leopard. Leopard Kung Fu does not overwhelm or rely on strength, but instead relies on speed and outsmarting its opponent. The power, as in all kung fu forms, comes from a solid stance, but in Leopard Kung Fu it particularly comes from the aggressive speed. The Leopard Kung Fu practitioner will focus on elbows, knees, low kicks, and Leopard Punches. The primary weapon is the Leopard Fist, which can be likened to a half-opened fist. The primary striking surface is the ridge formed by folding the fingers at the first phalange joint; the secondary striking surface is the palm hand. The Leopard Claw can also be modified for grabbing and tearing by slightly lifting the fingers to form a hook. Posted on September 1, 2012 May 17, 2017 by Interact ChinaPosted in Kungfu, Kungfu StylesTagged Animal style, Chinese martial arts, Furious Five, Kung Fu Panda. Check out interact China’s post about Shaolin’s animal styles.